I wrote the following blog last year, when the news of Senator Ted Kennedy’s brain tumor first broke. Last night the Senator lost his battle with brain cancer. May his spirit fly free, up there in the starry skies. Like so many others, I have been following the story of Senator Ted Kennedy’s health problems. I was stunned to learn his seizure was caused by a malignant brain tumor – he just seems like a man who would laugh off any illness that dared to enter his body! My dear friend, Judy Ditfurth, was a flight attendant back when the Senator first went to Washington. She often worked the DC/NY/Boston run, which was frequented by many politicians, including Senator Kennedy. Judy said she always liked him – he was very friendly, never demanding…a nice person. But here is what touched me about the Senator’s story -he was walking his dogs, Sunny & Splash, when the seizure occurred. The family members who visited him at the hospital included his four-legged buddies. And when he left the hospital this morning, his dogs were there to accompany the Senator home. 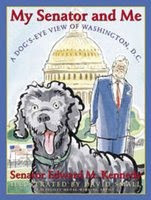 I didn’t realize Senator Kennedy had written a book about life in Washington DC from a dog’s perspective. It’s called My Senator and Me: A Dog’s Eye View of Washington D.C. Senator Kennedy, I know that between your family and your medical team you are in the best of hands. But I think you may also be in the best of PAWS! I hope you, Sunny & Splash will be walking together for many years to come.